Back in 1870, a Russian General named Alexander Gorloff was the military attaché at the Russian Embassy. While Alexander Gorloff was in America on duty, Russia itself was going through a restructuring of their military which including updating their arsenal. General Gorloff approached the famed revolver makers Smith and Wesson regarding the possibility of purchasing a number of their Smith and Wesson No 3 Top break revolvers. While the Russian military was impressed by the break open nature, and ease of reloading the No 3 presented they did not want the 44 S&W American cartridge, fearing it’s externally lubricated bullet would reliability issues requested a new internally lubricated 44 round. And with that, 44 Russian ammo was born. The 44 Russian was successful across Europe and America. The round became known for it’s inherent accuracy and quickly became a competition grade round. 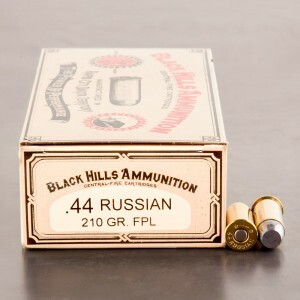 44 Russian ammunition is still a popular cartridge today with replicas of the Model 3 being chambered in the 44 Russian and modern production of the ammunition. The 44 Russian’s internally lubed nature became the new standard for cartridges, and influenced many cartridges after it. 44 Russian ammo also proved to be a reliable man stopper, and served the Russian military for decades until a domestic Russian handgun was adopted. The cartridge remains popular in the United States and many rounds like the 44 Special and 44 Magnum were directly influenced by it. The 44 Russian is used by many Cowboy Action Shooters who appreciate its soft shooting nature, and it’s excellent accuracy. Great Ammo shot very well in my old #3 Smith and Wesson Schofield. I have 2 revolvers chambered for .44 Magnum. The great thing about this caliber is that you can also shoot .44 S&W Special and .44 Russian in the same revolver. So, I decided to try this .44 Russian ammo in my S&W Model 624. The ammo performed great: low recoil, good accuracy and it didn't lead the barrel. I was shooting at a hardened steel plate at 50 ft. The soft lead bullets just flattened out against the plate with no danger of ricochet.